Guys, seriously this is the new awesome recipe of deliciousness. We’ve gotten into making one big pot of something on the weekend, then eating it throughout the week. The problem with this recipe is that it’s so damned good that there’s barely anything left. 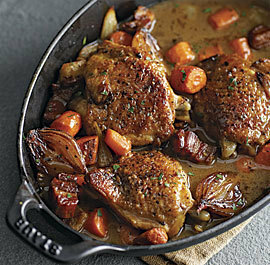 Seriously, if you are a chicken eater, MAKE THIS TONIGHT. OR TOMORROW NIGHT. I’M NOT PICKY JUST MAKE IT WHENEVER IT’S CONVENIENT AND THEN EMAIL ME TO TELL ME HOW AWESOME IT IS. Because it is awesome.